I feel like I’m still catching up on sleep from Princess Weekend. Actually, let’s be real here. I have a 15 month old who doesn’t sleep through the night yet. The 2:30am wake up calls during the Glass Slipper Challenge made for a longer stretch of sleep than I typically get. So I guess I’m still catching up on sleep from the birth of my son. I should really just be napping right now. Anyway. Princess Weekend was a whirlwind. Sara and I drove down to Disney on Friday night to sleep at the Art of Animation resort so that I could have uninterrupted sleep and we could wake at 2:30 instead of 1:30, because that would have just been crazy. We ran the 10k on Saturday and Sara had a PR by five minutes. Go Sara! On Sunday morning, we met up with Dorothy to complete 13.1 miles. I had been having stomach issues all weekend- I still haven’t figured out if it was related to the Clif shots (I took one prior to the start of each race-tested beforehand too) or if it was an isolated incident- and I had to stop to use a bathroom during the race, which I’ve never done before. Annoying. And TMI? (but really, any recs on pre-race fuel?) So, we ended up getting separated around mile five, but met at the finish to celebrate Dorothy’s first half marathon. For me, the highlight of the half marathon is the choir just before the finish. If you follow us on instagram, you saw my video from that moment (and yes, I thanked them as I passed). The real Disney magic of this race comes from the volunteers. They’re wonderful. They dance along the course, give high fives, cheer you on as you pass. When you walk into the bag claim (and for this race, you have to pass through even if you didn’t check a bag), they all applaud. It’s just really special. I said thank you to as many as I could, because they got up even earlier than I did, and they don’t get to go home until everyone is finished. If you’re reading this and you’re a race volunteer- THANK YOU. You make the race a success. Before the 10k. No, we did not run with the braids! Wondering, and wondering, and wondering, and wondering- when will this race begin? 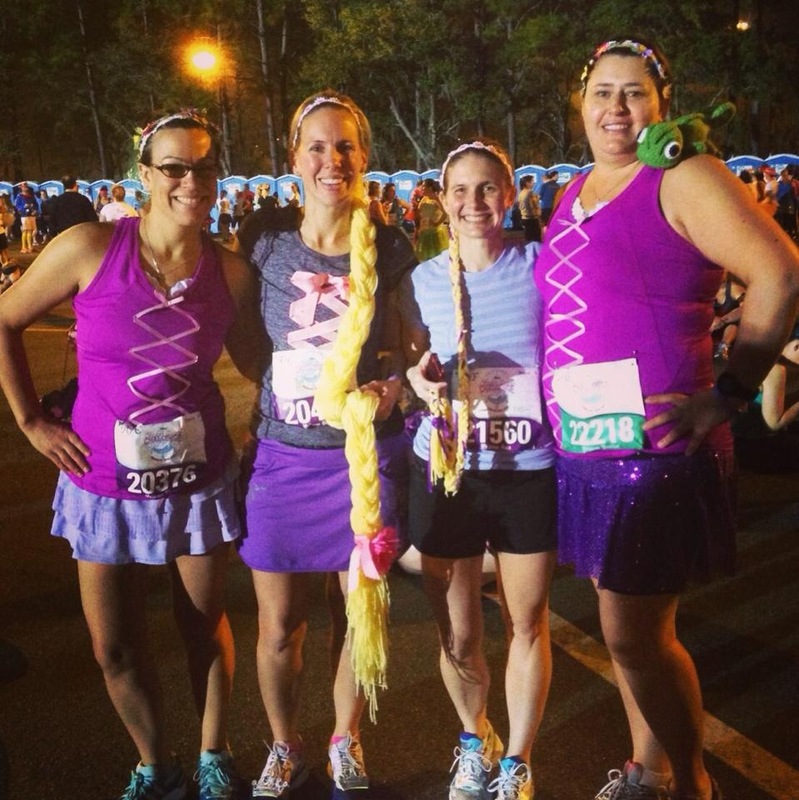 Yep, we totally stole our daughters’s Halloween costumes for the half-marathon. Our other PNK sister, Dorothy, at her first half-marathon! First, I have a baby who doesn’t sleep through the night. This isn’t a mom blog, and he’s my third child, and I’m totally not looking for advice. Or sympathy, haha. It is what it is, and the way we choose to parent- well, he doesn’t sleep through the night yet. He will eventually. As far as my running goes though, less sleep must factor into it, right? Second, and this is the big one…I’m not training to run faster. Oops. I know I have to run fast to get fast. I know it. I said that I would start speed work after the run streak and I didn’t. Womp womp. In the spirit of Meri’s brilliant post about faking it vs. doing the work, I am going to do the work- starting this week. Next up on my race calendar is a 10 miler at the end of this month, followed by two half marathons in April. I don’t plan to PR, but I hope to be closer to doing so (and I hope to get my fuel sitch figured out too). Any advice for me? For speed work, do you prefer tempo runs or track workouts? This entry was posted in Race Recap, rundisney, Uncategorized and tagged 1/2 marathon, Brooke, half marathon, Princess half marathon, race recap, runDisney. Bookmark the permalink. ← See Jess Run: Volume 2…and a giveaway! I find I hate tempo runs the most, more so than intervals, so my conclusion is that I should really be running more tempo runs. I prefer tempo runs! But I think doing intervals will make my tempo runs faster. Ha. Congrats on finishing both races! How wonderful it must be to run with a group of girl friends! I hope you catch up on your sleep! Thank you! I have a couple of girlfriend race weekends coming up and the baby will be at home with Daddy. I’m excited! I’m incorporating regular speed work into my training plan for my April half marathon for the first time (I’ve just done it here and there up till now) and I’m excited about it. My workout today is actually intervals: 7 x 400 at 5K pace. Except I’ll be doing them on the treadmill instead of the track because (here’s that having kids thing again) I need to bring my girls to the Y so I can exercise and the track at the Y is too small and crowded for speed work. Hi, Ben! Yes, I have to do 400s on the treadmill if I want to go that route. In the past, I’ve done tempo runs regularly, but I think I’m going to alternate and see how that goes. On the plus side, I have a lot of time- I’ve accepted that I’m not going to PR until November- but I would like to be fast enough to chase Vic for some of our nike race. Time will tell. Good luck in your half! Let us know who it goes. It was a great weekend, only thing I would have wanted was more down town so we could hang out more. I have no idea about how to incorporate speed workouts into my running (other than when we run in CrossFit) and I’m eyeing a time goal so I better figure it out. As far as gels go I stay away from them!!!! Clif shots or GU, they make me throw up (sorry if TMI), I use Clif Bloks or Pro Bar Bolt Energy Chewes. The bloks/chews are much better on my stomach, might be worth checking out. Not tmi, haha. I actually love the shot books but can’t use them now because I have invisalign and I can’t chew with them on (and shouldn’t take them off for that long anyway). I wish we’d had more down time too! Another race, hopefully. I prefer tempo runs but my friend who is a cross fitter loves using intervals for speed training. Good luck with your goal, Heather! Let me know how it’s going. I have no real advice for you but I think that you can surely hit your PR this year and do it with grace! I have great faith in you, B-rock! Thank you. Right back at you, babe! A) you looked adorable, which in some books is more important than a big PR. B) I find that I can’t do heavy sugar pre-race. Have you tried honey stinger waffles? They’re a little less pure sugar, and have a little more substance to them. C) I love tempo runs, interval repeats, and random fartleks. I haven’t run on a track in years, but often use the treadmill or blocks for speed work. Thank you! We felt pretty cute for 2:30am. I would love to chat more about what you’re doing for speed work. I’ve only ever done tempo runs, and while it’s worked for me, I think intervals would be even better. Can’t wait to hear! From your IG (the only social media I’m really good at, ha), looks like it’s going well! Also, you should come to NYC during a race weekend (while I'm there) so we can PR together! Love you, Lisa, and I just mentioned that possibility to Mer! We need to discuss over email. Love the costumes! Looks like you girls had fun, congrats! !